My heart goes out to Annika too. Hope she will be ok.
That's so scary to think about someone so young getting cancer. I hope she has a full and quick recovery. I love your gold skirt. The photo with you holding it up looks really pretty and made me think you should pin it up like that. Also, the last photo is amazing. Your jacket truly channels the Fantastic Mr. Fox look, and indeed autumn is by far the glorious of seasons. I was heartbroken as well when I heard about Annika. She is a friend that is beyond amazing, dazzling in beauty, and has the writing that brings people to tears and in laughter. I believe in her, and she will make through this difficult time. And oh no, I had never seen Annika's blog before but that's terrible! I hope she gets through it!!! you look incredible here. i always love your writing-you're so inspirational! anyhow, on another note, my heart goes out to annika. thanks for the rec. I love your blazer. So classic, like a crossover between Sherlock Holmes and Fantastic Mr. Fox. I think I am in love with that tweed jacket. I agree with you, autumn is tweed, taffeta and perhaps even velvet in resplendent hues. My heart goes out to Annika. Oh, that poor girl. I'll be hoping and praying that everything goes well with Anika and that she gets well. Gosh, I'm teary eyed just thinking of her. Please tell her to stay strong and positive. Only a compassionate heart can recognised another´s beauty. I adore your photos, That wonderful skirt and your kind words to Anika. I am off to visit her. That skirt is incredible! Love it! Cancer = evil I wish it would go home and not harm anybody else. Oh goodness, cancer is such an evil, uncaring disease. I wish nothing but the best for Annika. You look divine as ever! Love how the metallic looks in the black and white photo. I bought a Mulberry the other day, eek! I'm still waiting for its arrival and am ridiculously excited to own a classic piece that I hope I'll have forever x ps - i reckon if you turned your hand to design, you'd do a great job! 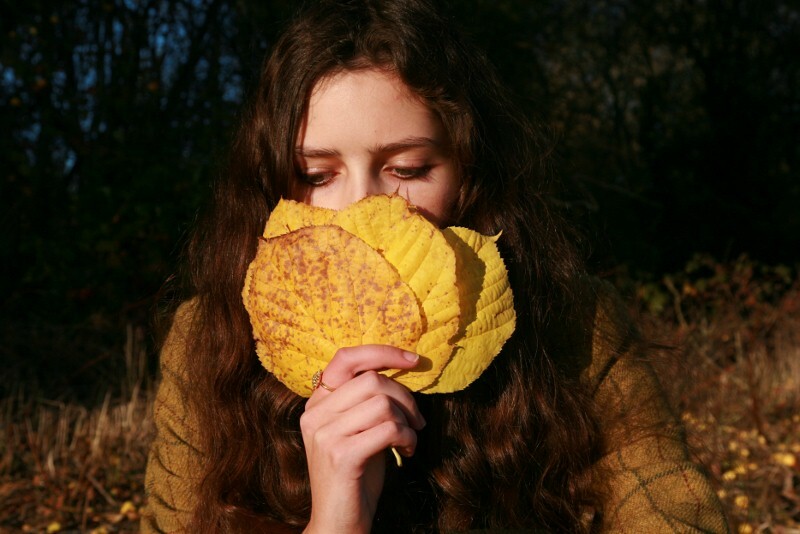 It would be lovely if autumn allowed us to dress in the fantastical ways we dream of. Alas, that's just dreaming on my part. Here we've surpassed autumn and have snow. I don't know Annika but she seems to be an absolutely amazing person and I'm sending hope and good thoughts her way. 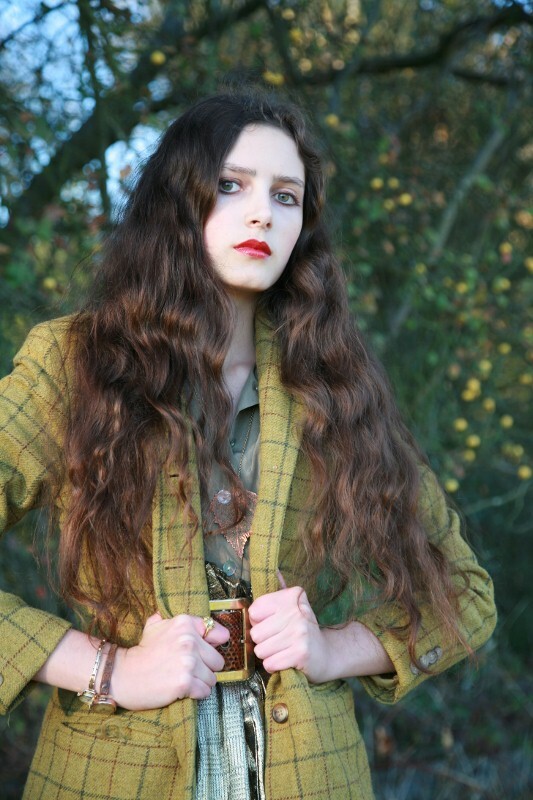 Great post, I love the jacket and skirt! Amazing photo's! You're so beautiful! Yellow taffeta? What a fabulous analogy. I yearn for smoky shades of cotton velvet and corduroy. I love your outfit, the foil skirt is perfect with the tooled leather belt. OMg darling you always look so beautiful! I hope that so of the agencies has some vit to sign you! Love the pleated skirt and layering! 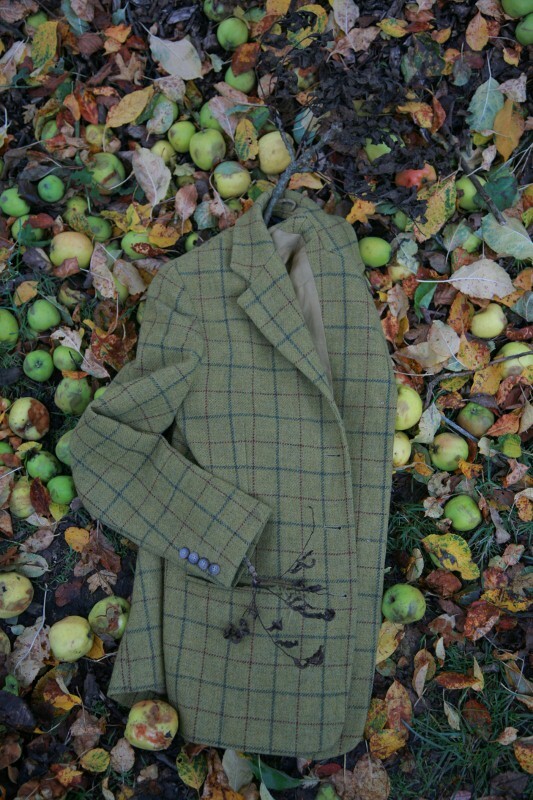 The shimmering golds warmed up by tweeds truly speak autumn. I love those huge leaves you are fanning in front of your face! It really is my favorite season just for natural beauty. Particulourly love the first three shots. You look really gorgeous darling! Agghhhhh Roz, i adoorre this skirt! it reminds me of one I had when i was little which bunched up in sections at the bottom with a rose like Belle.. it was made by my neighbour and was quite amazing/atrocious! yours is beautiful, was it a charity shop find? Oh.my, you looked absolutely stunning in carries film, I was constantly gasping! agree with all the points you made about autumn :) layers layers layers! My dear Rosalind, what an honour to be followed by you. We have known each other since for ever, and I thought we were following each other. I am so touched, my dear friend. Ahhhhhhhhhhhhhhhhhhhhh ( she screams) I am also in your blogroll. Your writing, style, and photographs are stunning as usual. Such a shame about the soles of the shoe's. They look amazing. Heading over now to offer some support to Annika. I came here to thank you for your comment: that was over half an hour ago. Before leaving my comment about how I love the photos, and what you said about autumn, and to ask where you got the gold foil pleated skirt, because I just met the loveliest woman last week, wearing the bright green top and silver foil skirt, and then I read about your friend Annika. How could I have been blogging this long and have never stumbled on someone as incredible as she is? Just so warm, honest, pretty of course, but also a beautiful person. I've been reading past posts, and feeling like I was getting to know her, and I'm comment #365, or 654.. the flood of love and support pouring in reminds me today, especially today - when I'm learning, and trying to come to terms with, new dimensions to the cruelty and dishonesty and viciousness of some of the women who blog - to see this side, the unconditional warmth, love, empathy and support - in most cases, for someone, as one of the comments said we 'don't know and probably won't ever meet'.. I, too, like Jenny, will be lighting a candle in my heart for her. Having lost my father to cancer - after a brave, 15 year good fight - and nearly losing my mom, I feel you couldn't have put it better: cancer, like terrorism, reminds us of the arbitrary unfairness of our world. It's not personal, it is random. But it is not a death sentence. Annika coming to terms with this shock now, and she's doing it bravely - I was in tears at her courage, and honesty - and, as she said, she knows she's not going to have a fun time ahead. But people do win: they do survive. And all this collective prayer: it works. You are so lovely, Roz. And I think I know the emerald pieces you're describing. And it's well time I shut up now! I really just came here to say hello, and to thank you. Beautiful post, on so many levels. And I love Tim Walker's work, too. ...what a sad story about Anika, why why why life is so unfair? Great post as always. The idea of craeating a label called "raspberry" to make it a trinity is hilarious. And oh yes, train journeys are truly perfect for pondering things. Thanks for stopping by and commenting. Have a great week and best of luck to Annika. Lovely blazer. I like the idea of trilogy with Mulberry and Burberry. I think "Elderberry" or even "Wolfberry" would be a good addition. Knowing that your also a Kate Bush fan, have you heard her newest album yet? I'm enjoying it so far not to mention Stephen Fry sings on the title track! I feel horrible for Annika, my thoughts are with her. Reminds me of the Tim Walker for Burberry shots. An inspired post-- gorgeous from pictures to prose! I really love the metallic skirt you are wearing in contrast to the leaves and natural tones of your photos. Your outfit turned out great in this shoot! You have an endearing way about you, my heart goes out to Annika. These photos I love very much, and the gold colour is gorgeous with the jacket! I was also excited for the adaptation of Wuthering Heights. all I have to say is that skirt is heaven!